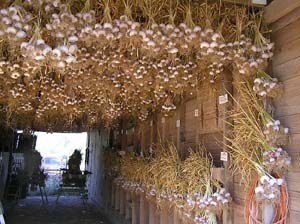 Harvests in early summer - stores 7-8 months. Creole Red is distinctively different from Burgundy and Ajo Rojo because of its unique shallot-like flavor and in that it sometimes has fewer cloves per bulb some years. In the number of cloves, Creole Red is sometimes like the Porcelain garlics with few but really big cloves. They are striking to look at. As its name might imply, it grows quite well in southern climates. Creole Red has a crisp and rich shallot-like flavor flavor and yet with enough pungency to let you know you're eating a real garlic but not so hot as to be painful. In a normal year I would say the flavor is about an 6 on a scale of 10 and the hotness rates about a 3 but with a distinct shallot-like flavor. Creole Red is an excellent all-around garlic for raw or cooked use and stores well.